Photo Frame Maker is easy to use photo frame software. You can add cool frames to your photos, very quickly and easily. Resize, rotate, adjust collor and add text to your photos. These can be finished in batches! You can print or mail to your friend. Photo Frame Maker makes working with your digital photos as easy as possible! Only Two steps add frame to your photos. Photo Frame Maker is Very Easy and Fast! Photo Frame Maker is easy to use photo frame creator software. ...... Photo Frame Maker is Very Easy and Fast! * Over 100 Cool Templates Included. The registered user can get a lot of Templates. * Support Unique frame maker. You can create your own frame styles. * Batch add Frame to your photos. * Batch add Text to your photos. You can choose the position, size, style, and color. * Support Resize, Adjust color, Crop, Rotation, to your photos. * Support print or email your photos to friends. * Support 5 kinds of formats, include BMP, JPEG, TIFF, PNG, GIF. 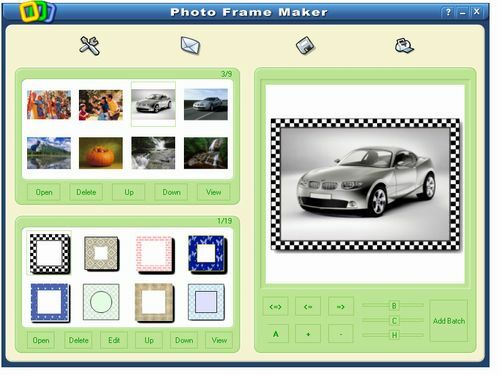 Qweas is providing links to Photo Frame Maker 2.8 as a courtesy, and makes no representations regarding Photo Frame Maker or any other applications or any information related thereto. Any questions, complaints or claims regarding this application Photo Frame Maker 2.8 must be directed to the appropriate software vendor. You may click the publisher link of Photo Frame Maker on the top of this page to get more details about the vendor.